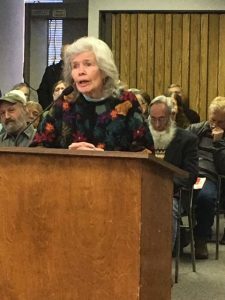 Local residents long-opposed to any use of chemical herbicides to kill off unwanted vegetation in Trinity County gathered en masse last Friday in Weaverville to protest plans announced by Caltrans District 2 to resume the practice this spring along state highways through the county. Speakers used the public comment period at the start of the Trinity County Board of Supervisors’ special meeting March 8 to voice their concerns and seek reaffirmation of the county’s long-standing policies against the use of herbicides. The issue was not on the board’s agenda, and there was no outcome except that the county will ask Caltrans representatives to attend a public workshop, not yet scheduled, to detail what the agency plans to do and hear public input. “This is like a 40-year reunion of SAFE. It was 40 years ago that we felt the need to form a group to stand up and complain in order to stem the use of chemical herbicides in Trinity County,” said Larry Glass, president of the Safe Alternatives for our Forest Environment group. The county’s first herbicide ordinance was adopted in 1979 to regulate the application of herbicides. Water quality and nuisance abatement ordinances designed to protect Trinity County streams from contaminants followed in the mid-1980s, but state law intervened, reducing county measures on herbicide use to advisory status. She asked that Caltrans present a detailed plan for what chemicals will be used, when, where and why, arguing the most common is Roundup which contains glyphosate that many countries have banned throughout the world as a potential carcinogen. A few speakers indicated they aren’t necessarily opposed to using herbicides to control vegetation along highways if it reduces the threat of wildfires being ignited by sparks from vehicles traveling the roadways. “Trinity County needs fire protection, and this may or may not be the first step to that, but at least somebody’s trying. I have not seen a lot of trimming and mowing of roadsides. That would be wonderful, but it needs to happen within the next month or two because we’re set to have what happened in Paradise happen here,” said Diana Sheen of Weaverville. John Knight of Weaverville argued for a data-driven discussion based on the science and specifics of the proposed plan and not on emotional arguments. “There are legitimate concerns about offsite spread of chemicals, but conditions 40 years ago were quite a bit different than now, and there are different problems we’re confronted with now. If there is any negative offsite effect, show us the evidence and we can all learn from that,” he said. Others noted that some of the most devastating fires recently were started along state highways in other counties where spraying does occur. It didn’t stop them. “Caltrans stopped spraying here in 1980, finding out mowing and weed-whipping work. We’ve had a couple of fires start along the highways, but not many. Don’t let them use that as an excuse. We’re having this change because of two new guys on the job who don’t know our history and believe they can solve any problem with chemicals,” said Joseph Bower. Some local cannabis farmers also objected, saying herbicide contamination could taint their crops. Others worried about potential contamination of fish, wildlife and the human food chain as well as the water they drink from streams and springs. Several thanked SAFE members for their many years of battle over the herbicide issue. “You put something out there, it disperses. It goes everywhere. This is the end of the world these people are bringing us. The insects, the bees, are dying and we have to stick together, put our foot down and tell them it’s not going to happen here,” said Buddy Hazard of Douglas City. “I praise Caltrans for the work I do see them doing and want to say, ‘nice job, keep it up and thank you.’ But we do need a better discussion on this movement toward herbicide use. It’s either remarkably rude or remarkably clueless about our ordinance, all this time later,” said Arnold Whitridge of Douglas City, asking for a future board meeting to clarify what the county’s position is now on the use of herbicides. “It’s been pretty consistent for 40 years. Please affirm it or if we need to change, let’s talk about it,” he said, adding everyone understands the county’s position is not legally binding on Caltrans, but some have questioned whether county staff is upholding and respecting county codes or speaking against them. He added he can make the request for a public meeting, but not command that Caltrans attend, saying he will push for a public workshop by the end of March or early April, “but all I can do is ask.” He said he will advertise it when he has a workshop date. Sup. 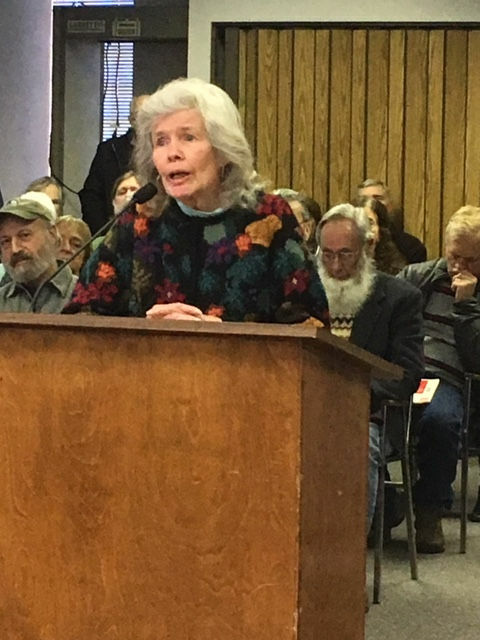 Bobbi Chadwick also requested an agenda item for a future Board of Supervisors’ meeting to review the county ordinances pertaining to herbicides and vote again. “I think it’s essential for them to hear from the public. On this issue, the public is much more persuasive than I can be,” said Sup. Keith Groves. Weedkiller suspected of causing cancer deemed ‘safe’ ? Advocating and informing the public about environmentally sound forest management.